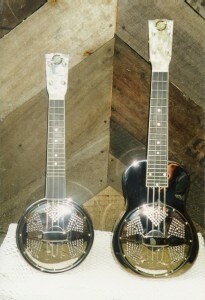 Back to the uke order: A few telephone calls and month or two later the uke was ready and sent to him in the US. 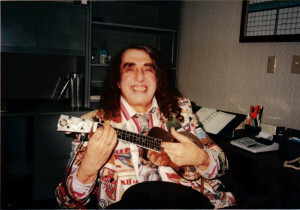 He was pictured in magazine articles holding his Beltona Ukulele. It was very good for our business profile. This is what we came up with . The scale length is 12 1/2 “, the cone is the standard 6” and the back is flat. The whole body resembled a cake tin but it sounded really good and was as loud as any resonator uke inspite of the small body. A few months later, Tiny Tim telephoned once again with a new request. Could we build a very small version of the uke he had – one that he could travel with easily? He wanted it to pack inside his suitcase but be as loud as the one he had already. I thought about the possibilities and called him back with the idea to make the uke with a body no bigger than it had to be to hold the resonator and the shortest possible playable scale length. 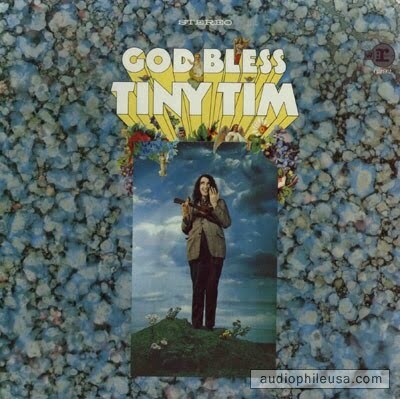 My partner Bill and I set about this interesting commission but, unfortunately, Tiny Tim died before taking possession of it. Mr Tim had a heart attack while performing: I am told that he was playing his Beltona at the time and he died a few days later. The man who was, some years later, to buy this uke from Mr Tim’s widow told me that the uke was dented from the fall when he collapsed. So the world had lost a wonderfully individual performer and we were left with an eccentric individual ukulele. This photo of Mr Tim playing his Beltona Concert Resonator Uklulele is borrowed from www.portable-infinite.blogspot.com where there is a transcript of an interview with him.